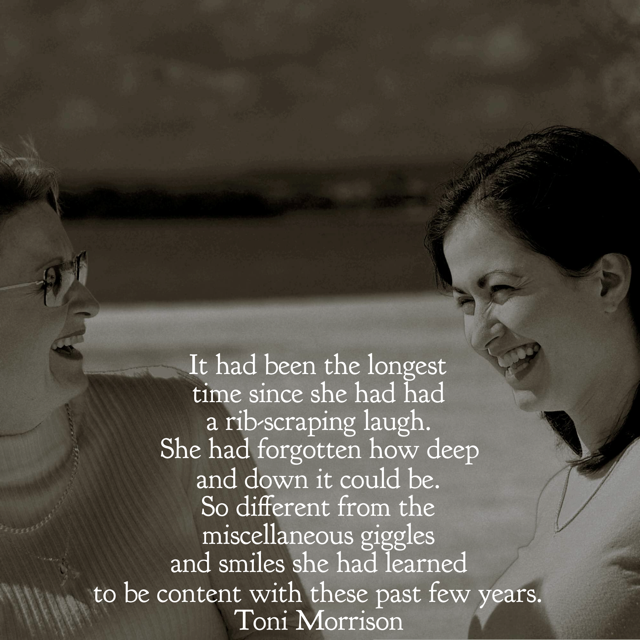 When was the last time you had a rib-scraping laugh? A rib-scraping laugh overtakes your body, your mind, and your soul. A rib-scraping laugh ends in tears that leak down your face and stress seeps out of you. A rib-scraping laugh sees you roll on the floor, clutch your sides and makes your stomach ache. A rib-scraping laugh somehow makes you feel that you can hope for better times, even though your heart is about to break. A rib-scraping laugh hurts but heals at the same time.The last two weeks have been challenging. My aunt had an accident and ended up in hospital. She was released into my care and ended up back in hospital. But, in the midst of challenges, tears and struggle, we’ve had some rib-scraping laughs. In the early hours of the morning, my aunt had chest pains, was clammy, had a headache and just didn’t feel well. After consulting a doctor friend, I phoned an ambulance. My husband was watching my aunt, so I took a quick shower. The night before I’d fallen into bed, exhausted from showering and dressing my aunt the night before, without taking a shower myself. Just as the water hit my body, my husband ran into the bathroom. He ran outside and I stepped out of the shower and threw a towel around me. ‘Hello?’ I said into the phone. ‘How’s your aunt’s breathing? Is she in pain?’ The ambulance operator’s voice had that calm, professional, it’s-going-to-be-okay tone, but with undertones of this-is-quite-serious. My aunt was up the other end of the house. I ran through the house, praying she was okay. I leant over her and asked the questions as per the operator’s instructions. “Give her three aspirin and put them under her tongue.’ The operator gave the instruction with a sense of urgency. I reached for the aspirin on the bedside table, and as I turned back to my aunt, the towel fell off. My hand was extended towards her, holding the aspirin. ‘Here. Take these,’ I said and grabbed the towel from the floor. Her eyes widened and then she started giggling. She clutched her chest, but the giggling continued. Hysterical laughter burst out of me, I got the giggles. My chest hurt from fear and the unfurling of feelings as laughter flowed out of me. I have no idea what the ambulance operator thought. I ran to put on some clothes. Over the last few weeks, there have been many laughs that have allowed us to let out some of the fear and frustration. We cried with laughter when my aunt reminisced about the times she and her dear friend had girls’ nights and the innocent fun they had. Tears of laughter turned to grief when she told of her friend’s illness and the terrible missing. There was a cynical huff of laughter when the hospital said my aunt could go home—to her own home—without a care plan. We laughed when I, the so-called carer, hit my aunt’s bruised head with the hairdryer. There was ironic laughter of recognition when I saw my grandfather’s, grandmother’s and mother’s history repeated in my aunt’s situation. I’ve been here before caring for elderly relatives and the denial of old age and the fight against age and circumstances is sad, poignant and, at times, funny. A rib-scraping laugh has several benefits, according to the Mayo Clinic. It improves your immune system, relieves pain, increases personal satisfaction, improves your mood, stimulates many organs, activates and relieves your stress response and soothes tension. Life brings us many things, but a rib-scraping laugh is a blessing in the midst. When the future is uncertain, when circumstances overwhelm us, when we’ve reached the end of our rope, sometimes a rib-scraping laugh is what keeps us from falling apart. Oh, Elaine…very good. I have tears from laughing! What you said is so true. A good belly laugh makes us feel so much better and capable.